Carmel Café & Wine Bar, with two Tampa locations in Carrollwood and South Tampa, is the perfect spot to relax and sip on a glass of wine while enjoying modern Mediterranean cuisine inspired by dishes from Spain, Italy, Greece, Morocco and France. “Carmel Cafe & Wine Bar creates a new dining experience that is defined by innovative cuisine, a selection of serving sizes for both food and beverages and a revolutionary menu ordering system (Menupad) that offers guests a simple and easy way to customize their dining experience,” said Managing Partner Jim Snyder. My husband Phil and I recently visited the South Tampa location at 3601 Swann Ave., only 30 minutes from Brandon. The first thing that you will notice when you enter Carmel Café & Wine Bar for the first time is a fairly large open area sectioned off to give an open and inviting atmosphere. There is a TV in the bar and comfortable seats and sofas for those just looking for a relaxed bar atmosphere. We went on a Saturday night, and the crowd was a nice mix from date night couples to much larger family celebrations. The eclectic menu has many choices from appetizers through dessert and of course, because it is a wine bar, over 80 different wine choices, which are served either by the bottle or by the glass in three, six or nine oz. servings. Smaller servings give the opportunity to sample a few different wines. We ordered our meal with the Menupad, an interactive menu that allows you to customize your order as well as play free games. Your waiter will assist you, or you can choose to order off the traditional menu. With Menupad, you order only the portion of the meal you are ready to eat, allowing you to relax between courses and order when you are ready. We ordered the grilled lemon chicken and artichoke flatbread as a shared appetizer, which turned out to be a great choice. 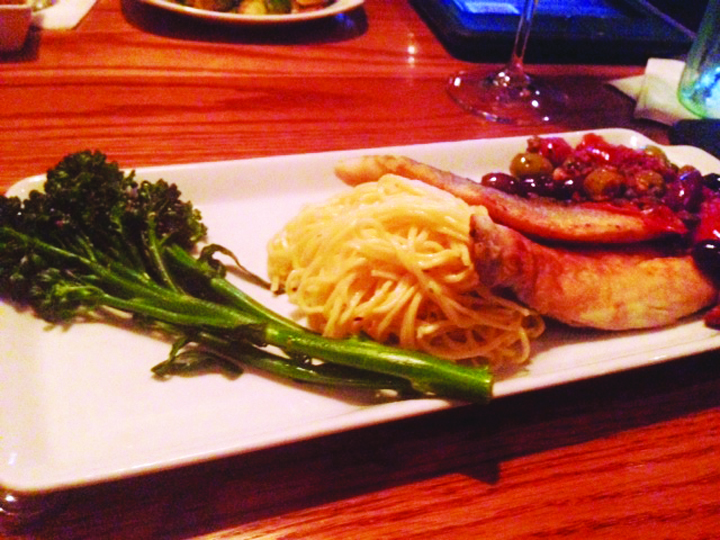 Phil ordered the Caesar salad which was very fresh and had the Mediterranean Sea Bass for his main entrée, which came with tomato, olive, caper, herb oil angel hair pasta and broccolini as sides. 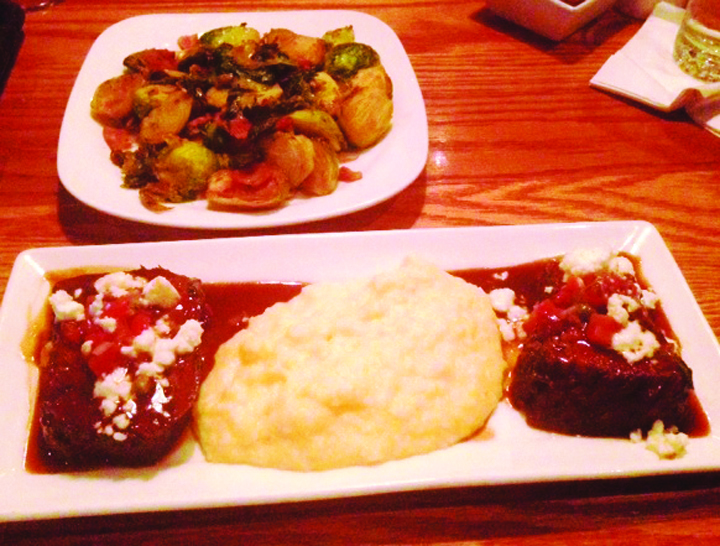 I ordered the Braised short ribs with creamy polenta and olive tapenade and a side of the caramelized Brussels sprouts. The meat was extremely tender and had great flavor. Diners have a choice to order small or larger portions for most of the meals. By ordering a smaller portion, you can experiment by adding another side dish or a soup or salad and possibly have room for dessert. As a lover of anything chocolate, the chocolate lava cake was recommended, and it did not disappoint. It came warm and with a side of vanilla ice cream. The cake was dark chocolate and not too sweet; a great combination with the ice cream. Carmel Café & Wine Bar’s other Tampa location is at 14306 N. Dale Mabry. Other locations are in Clearwater, Sarasota, Winter Park and Wayne, PA.
For more information on the restaurant and view upcoming events and weekly deals at each location, visit www.carmelcafe.com.